On the 14th September 2018, Biafrans in Southeast and South-South regions in Nigeria, observed one-day strike action (sit-at-home) in honour of our kith and kin brutally murdered by the Nigerian Islamic military forces during the Operation Python Dance II. It was declared not only to mourn hundreds of our youths that fell victims to the reckless and lawless invasion of Nnamdi Kanu’s residence in Afara-Ukwu Umuahia, Abia state which contributed to the death of some members of the Indigenous People of Biafra (IPOB) and abduction of Kanu and his aged parents, but to always evaluate the activities of the saboteurs and betrayers among us who, because of political patronage and peanuts they receive from the Hausa/Fulani oligarchy and salafist up north, chose the way of the biblical Judas by giving moral and tacit approval to this mayhem unleashed upon our people. We remembered and mourned our dead, our grief knew no bounds, we recognized and consoled ourselves on the fact that they died for a just and worthy cause. We will always remember their dedication and commitment to our collective aspirations for a sovereign state of Biafra, where everyone is equal in the eyes of the law; irrespective of class, race or religion. We seek to build a nation where we shall all be proud of, with a sense of belonging, prosperous and egalitarian society where all shall display their passion and patriotism. Each time the monsters came calling, the tendency is that they will kill, steal and destroy; leaving us psychologically wounded as we count our losses. The question on the lips of Biafrans is: how long are we going to fold our hands and condone this heartless, inhumane and malicious destruction and trauma visited upon our young and vibrant men and women in the name of one military operation or another. It’s no longer news that one year on, no one have been held accountable for these heinous crimes against humanity unleashed on our people in this 21st century because there were no justice for the dead and the wounded, we are left in perpetual grief and unending agony. In Nigeria, impunity and lawlessness is a state religion, a norm rather than an exception. Nigerian security forces brutalize, torture and kill on every slightest opportunity, knowing that there are no checks and balances in the system, that would have served as deterrent to official impunity and lawlessness. 14th September 2018, was a day we all sat at home, licked our wounds, counted our losses and prayed that the world should take serious note of the aggressors and the victims, in our case with the Islamic soldiers in Nigeria. We insist and make bold to say that freedom of association and our rights as indigenous people to self-determination cannot be quenched through the barrel of guns nor any form of bullying, intimidation, torture, brutality, illegal arrests, detentions without trial and/or murder. As long as we are in tandem with local and international laws concerning self-determination, our struggles must continue without bulging, until Biafra is restored. 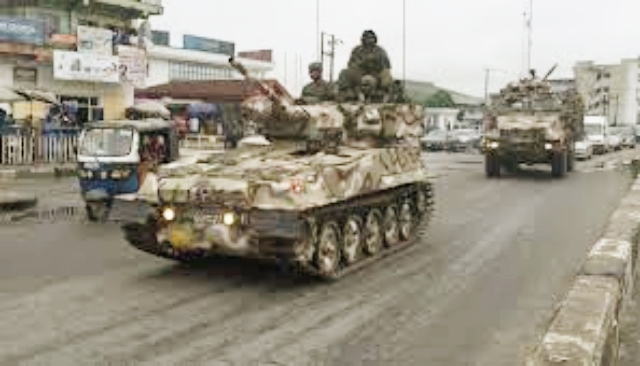 As the monsters appear, brandishing their newly-acquired weapons of mass destruction on armless and defenseless citizens, in civilian neighbourhoods and not on war frontlines, our people are being murdered in cold blood, the immediate aftermath, the family, friends and the entire IPOB family will mourn their loved ones. While we pray and hope that common sense will prevail on the part of the Nigerian government to urgently do the needful and heed the call by Biafrans for a referendum to resolve this present impasse and stop further bloodletting. To our dead comrades and colleagues, I say may the good Lord grant you eternal rest. To the bereaved families and friends, I pray for the fortitude to bear your irreparable losses. Our promise to hold the banner and consistently raise the flag of freedom and liberty, in memory of our fallen heroes and heroines until Biafra is restored is unshakable and unquenchable.